Where have the old Jewish villages in Poland gone? Only their names survive today in memory. Nostalgia, humor, sorrow, the major themes of the diaspora, the poetry of everyday occurances – reflected in the predominantly anonymous Yid­dish songs is the lost world of Jewish life in the shtetl, the Jewish settlements of eastern Europe that were ravaged repeatedly through the centu­ries by pogroms and finally obliterated entirely by the Holocaust. Composers have again and again let themselves be inspired by the spiritual and emotional cosmos of these often simple and yet powerful lyrics. Transported by the universal language of music, a part of the culture from which they originated could at least be saved for posterity. 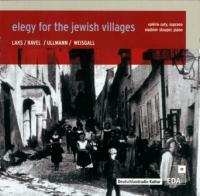 Jewish destiny in the twentieth century is poign­antly reflected in the arrangements presented on this CD. The pieces that form the framework de­lineate, as it were, the beginning and end points of the catastrophe. For Ravel, the “Hebrew” melodies represented a stimulus to explore a new, “exotic,” and living culture that was a com­ponent part of European civilization – no different than the Greek, Italian, and Spanish folk poetry that, along with a further arrangement of a Yid­dish song (Meirke, mein zun), he brought together in 1910 in his cycle of Chants populaires. In 1914, however, on the eve of the First World War, the first “twilight of mankind,” precisely the melodies selected by him attain a special significance: the Kaddish – the prayer of mourning from the Jewish liturgy, written in Aramaic, set by Ravel in magi­cal, quasi-oriental sounds – enters into a profound dialogue with the Yiddish Alte Kashe, the eternal question, for which there is no answer. In the late 1920s and 1930s, the works of Polish composer Simon Laks were performed together with Ravel’s in Paris. When he composed his Eight Jewish Folk Songs – in 1947, a year before the declaration of Israel’s independence – this was done in remembrance of an irretrievably annihi­lated culture. The Kaddish becomes here an Elegy for the Jewish Villages, a secular lament. Laks survived the Auschwitz II–Birkenau extermination camp, initially as a member, then as the director of the men’s orchestra. His book Music of Anoth­er World (Musique d’un autre Monde) numbers among the most important literary documents of the Holocaust. After decades of neglect, Simon Laks’ musical oeuvre is finally being rediscovered today. Along with Pavel Haas, Hans Krása and Gideon Klein, Viktor Ullmann, a pupil of Arnold Schoenberg, numbered among the outstanding representa­tives of the Czech avant-garde in the generation after Janácek. He composed his Three Yiddish Songs in Theresienstadt in 1944, shortly before his deportation in the autumn of that year to the Auschwitz extermination camp, where he, like Pavel Haas and Hans Krása, died in the German gas chambers. The songs are an anthroposophist’s declaration of belief in the Jewish culture that was facing its destruction. Music as an assertion of spiritual dignity in the face of humiliation and dehumanization. Hugo Weisgall, an American composer of Jewish-Czech extraction, composed his Seven Popular Songs from the Yiddish in 1967, the year of the Six Day War that was so decisive for the history of Israel and the Near East. Weisgall’s cycle was written from the completely different perspective of a successful, second-generation Jewish-Ameri­can composer. In this cycle, Weisgall succeeded in fusing the melodic and linguistic simplicity of the Yiddish melodies with a complex, avantgarde tonal language. Some of the songs presented here are parallel settings of the same melodies and texts. What the composers have in common is that out of great respect for the songs’ consummate beauty and characteristics, they quote them without adulteration. We become witnesses to a dialogue between the very personal compositional styles – which are stylistically obliged to diverse cur­rents of the twentieth century, and also nation­ally colored – with the “archaic,” quasi-ageless language of the respective songs. NB: We would like to thank Antoni Buchner for all his support and for the translation of the Yiddish and Polish texts into German. Sincere thanks to Lia Martyn (Moscow/Berlin) and Gila Flam (Jerusalem), who helped him resolve ambiguous issues.